The Phillips Collection is constantly changing. You never know what will be on view from one day to the next. Imagine my surprise when I entered into the newly-opened exhibition History in the Making: 100 Years after the Armory Show. There, hanging ever-so-gracefully, is Maurice Prendergast’s On the Beach (ca. 1907-1909). I’ve never seen this work of art in person before, having only worked at the Phillips for one year. And — as if by magic — we just featured Prendergast’s effervescent watercolor in one of the education department’s pilot Twitter chats, #breakforart. 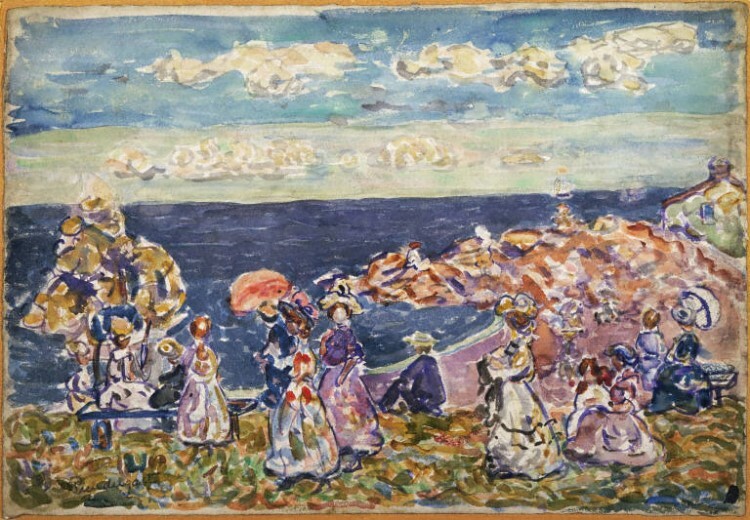 Maurice Prendergast, On the Beach, ca. 1907-1909. Watercolor and pencil on paper, 14 1/2 x 21 1/2 in. (36.83 x 54.61 cm). The Phillips Collection, Washington D.C., Acquired 1926. These Twitter chats are meant for you, our public. When the museum is closed, the works of art still live. We’re opening up the museum, virtually of course, on Mondays for you to comment, question, provoke, laugh, and be inspired. Be a part of our Twitter chat experiments by joining us each Monday through September 30 from 12-1pm EST. Follow the Phillips on Twitter as we #breakforart! And in the meantime, you can catch up with the rich conversation on that Prendergast painting, here. New to Twitter? Want to join our chat? Just search @PhillipsMuseum or the hashtag #breakforart each Monday at 12 EST to join.